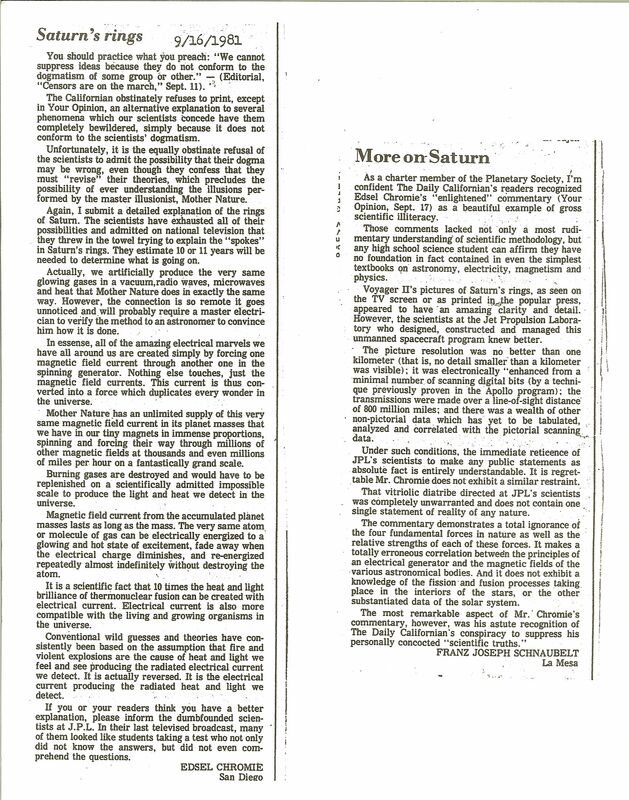 (SAN DIEGO) - Thirty one years ago I was vilified by a member of the Planetary Society for an article I wrote to the “Letters Editor” section of a small local newspaper. (See the full article and response in the following attachment). Now I consider this attack on “a beautiful example of gross scientific illiteracy” as a compliment because history has proven that I was right and he and the scientists were the ones who were scientifically illiterate in this particular circumstance. I knew they could not explain the spokes in the rings unless they revised their theory that they were caused by the physical movement of solid particles and I was right. Unless they realize that theses rings are created by normally invisible atoms of gases being stimulated to a glowing, visible state of excitement, Dr. Porco is right: They will never be able to understand what is going on around Saturn. They reason these facts could not be found in the textbooks is because the textbooks were deficient and wrong in many instances. Again, this was not in the textbooks in 1981. The scientists still publicly admit they cannot explain many details of the Sun, the auroras, comets, quasars, pulsars, black holes, dark energy, dark matter, the volcanoes of Io, the plumes of Enceladus, the great red spot of Jupiter, many anomalies in the rings and other aspects of Saturn, the high velocity winds of Uranus, what triggers a hurricane, what triggers earthquakes, what triggers a volcano eruption, what causes the jet stream wind to blow Eastward 300 mph faster than the already 1,000 mph ground speed of the Eastward rotation of the surface of the Earth, what causes the “ring of fire” on Earth, etc. Many of the explanations are really bizarre and preposterous, Such as the explanation that our Sun and the stars have an internal thermonuclear furnace and are fueled by hydrogen. And the Sun and the stars are “In a titanic struggle between nuclear energy forcing outward and gravity forcing inward.” And they speculate that when the fuel runs out “gravity collapses the entire mass from billions of miles in diameter to the size of a basketball in a matter of milliseconds to create a black hole.” This scenario violates several of the laws of physics, yet it is advocated and supported by many of the highly qualified physicists who should know that this is absolutely mathematically and physically impossible. Many of the current speculations also advocate that a black hole “devours planets, moons and stars that come too close to a black hole.” This is also foolish, childish and physically impossible. As I have stated many years ago, a black hole can be attributed to an abnormal concentration of electromagnetic energy similar to the intense energy created by the automotive ignition coil. In this instance, a very weak magnetic field current is applied to the many outer windings of wire of the coil. This produces an extremely powerful surge of electromagnetic energy through the center of the coil to produce the intense spark of ignition. Extrapolating this 3 inch diameter coil to the grand scale of a 1,000 light year diameter of a galaxy with thousands of stars with their combined magnetic field currents representing the weak outer winding energy of the ignition coil and it will produce a tremendous flow of energy through the center of the galaxy. This energy does not “devour” anything in order to acquire energy. It is simply a matter of normal accumulation of mass and energy in a natural growth of mass over centuries. This concept is entirely within the parameters of the laws of physics and can be assimilated in any laboratory by any college science student. The energy of this concept represents the dark energy and dark matter. Viewing the core energy of the black hole in the direction of the flow of energy through the core will create the appearance of a black hole because the flow of energy away from us at the speed of light will cause an area of negative light energy. While viewing the core energy of the very same mass with the flow of energy coming toward our line of sight will create an area of abnormally intense energy flow and create the appearance of the brilliant light of a pulsar. This one concept solves several of the mysteries the scientists have been trying to explain with their bizarre and foolish speculations and can contribute to solving many more mysteries. Edsel Chromie is a Detroit Michigan native who moved to San Diego in 1965. Edsel is a World War Two Navy veteran who served as a motor machinists mate on diesel electric systems where he learned about the magnetic field current swirling around the primary current flow through a wire as a part of Navy training to trace the direction of flow of the electricity in case of torpedo damage.